Located at the junction of Main St. and Kilkare, across from the Niles Canyon Railroad Depot, the Gardens are favorite meeting spot for Sunolians and visitors. The area has several picnic areas as well as an arbor/bandstand, bocce ball court, horse shoe pitch, and walking path. The Sunol Depot Garden was created for the citizens of Sunol and the people that ride the NCR trains. It is not a public park. The Friends of the Garden manage and maintain the Garden for the enjoyment of all. This is an all-volunteer group of Sunol people with the sole purpose of keeping this unique space for your enjoyment. You can help this effort by following a few simple rules. HOURS-The Garden is open during daylight hours only. NOISE- No amplified sound or music. LAWN AREAS- Nothing to be set up on the lawn areas. NON-RESERVATION USE- The Garden is available on a first come basis. You may not save tables without a reservation. VEHICLES- No vehicle parking beyond the designated parking areas. TABLES- if the tables are moved they must be returned to their original position. FIRES- No open fires allowed other than in the BBQ grills provided. DOG OWNERS- Clean up after your dogs. Bags provided. CHILDREN- Children must be supervised for their safety and to prevent damage to the area. CONDUCT- Be considerate of others using the Garden and the area neighbors. SMOKING- Take your cigarette butts with you. Note: Your use of the Garden is contingent on observing all of these rules. The right to use the Garden is at the discretion of the Pacific Locomotive Association and the Friends of the Garden. The Sunol Depot Gardens is open to the public and reservations are generally not required for small groups. An entrance fee cannot be charged for any event. The Bocce Ball / Picnic / BBQ area at the rear of the park cannot be reserved and is always available to Sunol residents. Reservations require a Sunol Sponsor, either a resident or Sunol-based non-profit organization. Standard reservations can be made between 1 week and 3 months in advance. A maximum 4 hour period may be reserved. Larger events must be reserved at least 3 months in advance and require review and approval by the Friends of the Park steering committee. No vehicles are allowed beyond the parking lots except for approved deliveries. As a Sunol Sponsor, the Pacific Locomotive Association can make a limited number of reservations in association with their Sunday train activities. Please see their site, http://www.ncry.org/ for more information. The members of the Sunol Wood Fired Oven Society will manage, maintain and oversee the use of the oven. The oven is for the sole use of established Sunol groups and organizations. A NON REFUNDABLE $25 fee will be will be collected from the organization for the upkeep of the oven. At least one Oven Society member must be present to help operate the oven and make sure that the area is cleaned up by the group after the event. The Oven Society has the sole discretion to reserve the oven on behalf of Sunol organizations as to the appropriateness of the event, the weather conditions at the time of the event and to make sure that the group respects the use of the oven and the Sunol Community Park. 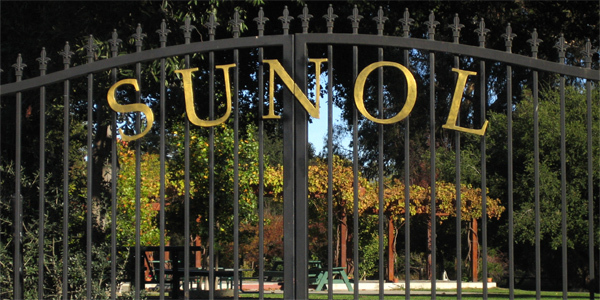 The Sunol Depot Gardens is maintained and managed by the Friends of the Garden, a group of primarily Sunol residents who are willing to donate their time and energy to the maintenance of the park. The park is operated based on an agreement between the Friends of the Garden and the Pacific Locomotive Association. To join the Friends, email sunolpark@sunol.net or simply show up at one of our park workdays. The PLA operates the Niles Canyon Railway that operates between Sunol and Niles. The Sunol Depot Gardens land is leased by the PLA from Alameda County as part of the train transportation corridor. As a major user of the park, the PLA partially funds the Friends of the Park, and provides insurance, water and electricity.